Like most homeowners, I have an ever growing project list I want to slowly tackle to make my home feel more us and well like home. One of those items on my list is adding curb appeal to our garage. I think garages get the short end of the stick design wise with it comes to adding curb appeal, they either look amazing or ho-hum. I've rounded up a my top Six Ideas to Add Curb Appeal to garage. No. 2 Bansish your boring dated and way too small light fixtures. Personally, I love XXL light fixtures, especially next to garages. Large light fixtures are more scale appropriate next to garage doors. On my house, I choose super larage lighting to reside on the side of my garage and the look is so much cleaner and modern, then a teeny tiny light, trust me. on your garage door, transforming your garage from so-so to wow. No 5. The easiet way to add curb appeal to your garage, add plants! Plants soften the look of garages, add hanging baskets next to the garage door, plant a vine to grow up the side, or add large planters in front of your garage. No, 6 Install transom windows above your garage door. I love this look for a few reasons, Transom windows let light in and depending on the style you add they can open and close, letting fresh air in! Also if you have an large expanse of room above your garage door that look a bit awkward of bare, transom windows can make that dead space look purposeful. For my house, to up the curb appeal to our garage, I plan on softening our garage door with large planters filled with flowers, along with adding transom windows. 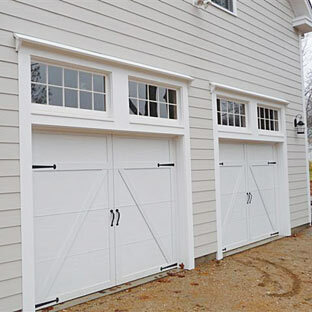 I'm a bit obsessed with the idea of transforming all the dead space above my garage door and adding a row of transom windows that open and close. Adding these window is on my list to tackle very soon! Have you added curb appeal to your garage?